People are looking for honest and responsible guidance as they walk their path of Irish magic, spirituality, or heritage. This structure is designed for those of you who would like to begin the journey of retrieving or re-creating your own personalised modern system of Irish magic, connection and spiritual practice. Lora O’Brien takes the reader on a journey in each chapter. She asks lots of questions, meant to find out what you know about Irish mythology, for instance, but also to realise what it is that you’re after. What is it that is interesting for you. Be honest. Write it all in your notebook, the most important instrument in this course. Actually, the book is described as a resource, a collections to help the reader find his way. The reader has to do the journeying, has to do the work. The author provides real information, honest and practical experience. But I recognise it as a guidance course: as well informing as inspiring. Both for reading and for soulsearching and researching. The reader has to think for himself. Or herself, as may often be the case. Lora O’Brien addresses her reader as if she or he is present. She shares her experiences, and gives sound advice. There is a large amount of Irish stories, myths and history but what really makes it a book about Irish spirituality, is the choice of subjects and the way the stories are intertwined. The book has three main parts: the World of Earth, the World of Sea and the World of Air. The first part contains the chapters Ancestry; Ancient places and Sacred cycles. In Ireland, you can hardly throw a stick without hitting something ancient.’ As modern Pagans, Druids, Shamans, Witches, Celtic Christians… whatever you choose to call yourself, or not call yourself, we have responsibilities. Respect the place, do not leave litter! One way of expressing a personal connection is a guardianship of a particular place. The chapter on Sacred cycles – Rhythm – starts with asking questions about the Pagan ‘Wheel of the Year’. Without checking anything: which festivals do you know, and why did/do people celebrate each festival? Why would you? The second part is about The Sidhe; Gods and Goddesses, and Otherworld journeys. About Otherworld journeys: the book contains at least nine of those, and the idea of journeying is fairly integral to the modern Pagan movement. Think Pathworking, or the travelling of the Shaman. Mind you, as Lora O’Brien rightly brings to the attention of the reader: there’s quite a difference between being a Shaman and using shamanic techniques! The last part is about Magical Craft; Literature and Priesthood and community. The chapter on magical craft is introduced with a story about a girl trying to escape from a predator: a person in a car on a silent country road. The exercise derived from this experience is: “The next time you are in a crowd of people, or a social situation, begin to practice doing two things. The first is to make yourself invisible. You can achieve ‘invisibility’ by creating a mist around yourself which hazes people’s view of you, or weaving for yourself a slippery cloak to wear which causes people’s gaze to slide right past you. … The second thing to practice, again in crowds or social situations, with people you are not very close to, at first – is the ability to see through other people’s mist.” The literature chapter gives a long reading list and deals also with poetry and spells (there’s a relation) and ogam. The last chapter involves how to welcome children in your family, and how you end up with a ritual. And it speaks of male and female mysteries. All in all an inspiring book, especially for people with a close connection to Ireland, but certainly not only interesting for those. 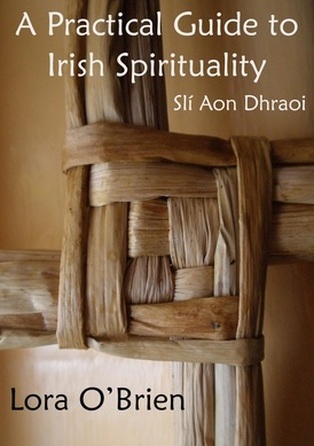 It has all the practical and down-to-earth advice that Marian Green gives in her books, and contains a wealth of knowledge on Irish spirituality, and guidance on how to make your journey a personal one.